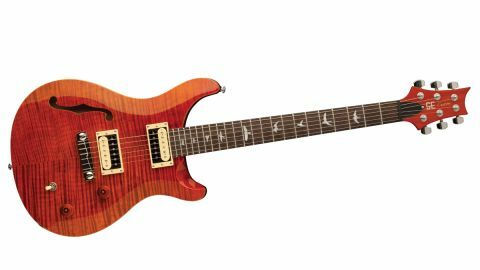 A double-cutaway semi-hollow Custom makes a return to PRS's SE line. An affordable masterpiece? With classic rock and blues tones in abundance, easy modding and upgrading options, and good playability, this guitar is ready to gig. Fantastic balance of value and performance. PRS is marking its 30th birthday with a bewildering number of new models. The affordable SE range is seeing plenty of these - including an SE edition of the Custom 22, and Semi-Hollow version, which is what we're looking at today. While the two guitars are close in spec, the solidbody version features a pair of Tone Furnace humbuckers from the SE Marty Freidman, while the Semi-Hollow features the more traditional 'original spec' 'buckers. The Custom arrived in 1985 as a 24-fret guitar, and a 22-fret version finally followed in 1993. Why the fuss? Well, removing those two frets has a real impact on the guitar's feel. The Custom 22 has a slightly more classic vibe, your left-hand doesn't have to reach as far and, importantly, the shorter neck is also stiffer. A stiffer neck brings a slightly different sound - it's a bit more LP-like, especially combined with the wrapover Stoptail bridge here, as opposed to the Custom 24's vibrato. "There's a beautiful light weight, generous ring and sustain." The Custom 22 S-H has a maple top with flame maple veneer and single f-hole, just like the fantastic SE Zach Myers Singlecut. Unlike that guitar, however, the top here is contoured. Maple is used for the set neck instead of the more usual mahogany of the USA core and S2 models, here with a 'wide thin' profile that's slim-depthed but far from a 'speed' neck. Bird inlays decorate the rosewood 'board, which also sports tidy medium gauge frets and the sort of set-up you'd expect from a much higher-priced guitar. This value perception, enhanced by the quality gigbag, continues with its plugged in performance. There's a beautiful light weight, generous ring and sustain, and a classic tonality that has slightly more midrange colour than you get from the solidbody version. It's no ES-335, but it has a different ring to the solidbody Custom 22, even when it's unplugged. It's a great axe for classic rock and blues: raunchy but not over spiky in tone or output, with musical harmonic feedback aplenty if you kick in a level boost from your pedalboard. It's quite the contrast to the solidbody Custom 22, with it's quite ferocious Tone Furnace bridge 'bucker which pushes out more power and drops you metal territory. That said, switching to the neck pickup on either guitars offers a similar voice - classic, vocal, and really emotive for solos. If you think PRS's SE guitars are just poor man's versions of the USA models then, not for the first time, you might have to reconsider. The S2 version of this guitar costs twice as much, remember - and it isn't twice as good.